Brochures stamped H CUNTZ have shown up in the Virtual Steam Car Museum. A cursory internet search found the following Stevens Institute of Technology alumni article. Gift to Library from Herman F. Cuntz, '93. A notable addition to the automobile literature of the Stevens Library was made recently by Herman F. Cuntz, '93, who has been associated with the automobile industry since its beginning in this country. He was with the Pope Manufacturing Company, at Hartford, Conn., when they began experimenting with "horseless vehicles," in the early nineties of the last century, and at that time he started a collection of books and magazines relating to the history of the self-propelled vehicle, going back to the early types of steam road carriages. He discovered the famous Seldon patent and directed the extensive litigation connected therewith, in the course of which the whole automobile art was gone into most extensively. The literature which he has now presented to the Library consists largely of American and foreign automobile journals covering a period from the nineties to recent years, besides a number of books on various engineering subjects, some of the latter having been part of the library of his friend, the late Captain William Griffing Ford, a graduate of Annapolis, Class of '81, who served with distinction in our war with Spain in 1898, who took a prominent part in organizing the New York Naval Militia, and who was engaged in some notable civil engineering work, principally in the line of harbor improvement. It will be recalled that Mr. Cuntz was responsible for securing the Selden vehicle and other early types of automobiles, which now form such interesting exhibits in our Museum. This Edward S. Clark Steam Car trade catalogue is stamped H CUNTZ. It is part of the John A. Conde Steam Car Literature Collection in the Virtual Steam Car Museum. 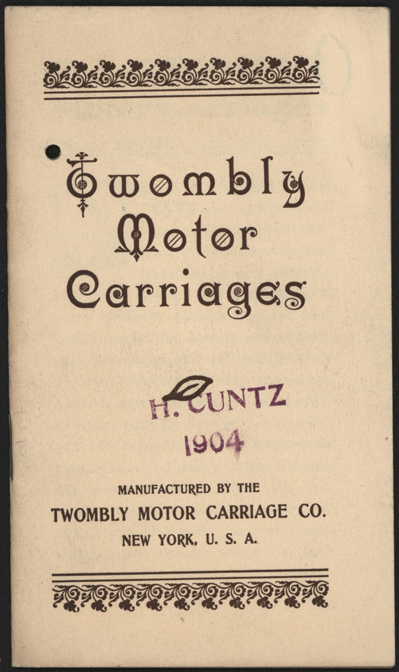 This Twombly Motor Carriage Company trade catalogue is stamped H CUNTZ. It is part of the John A. Conde Steam Car Literature Collection in the Virtual Steam Car Museum. "Gift to Library from Herman F. Cuntz, '93," Stevens Indicator (Member of Alumni Magazines Associated), (Hoboken, NJ, Stevens Institute of Technology, Vol. XL, No. 2, March 15, 1923), p. 27. Contact us if you have additional information about Herman F. Cuntz and his donation to the Stevens Institute of Technology, or if you have questions.